Dmaxstore has you covered. From basic routine maintenance, complete engine / transmission builds to steering and suspension replacements or upgrades. All major credit cards gladly accepted, we can even handle your extended warranty and insurance claims. No charge basic diagnosis/inspections with other services to all customers, we are here to help. Whether you are going to make the repair yourself or choose us to handle it we want to be your preferred destination for your Duramax needs. Fuel system, engine, transmission, differentials, turbo, cylinder heads, electrical, steering, suspension, towing, brakes, cooling etc…I think you get the point, we do it all. Excellent installation is always available on any aftermarket or OE part. We have been exclusively serving the Duramax diesel powered 2500 – 3500 trucks since they first hit the market in 2001. Our Service Department has been hand selected and has the highest levels of GM training and ASE certifications. Need a custom built motor, Stage 5 Allison transmission, fuel system upgrades, lift kit, steering and suspension repairs or anything else? Dmaxstore can help you select the right parts and get them installed. Standard scheduled maintenance is quick and convenient at Dmaxstore. All parts and fluids are always in stock. We will keep your factory or extended warranty in compliance and up to date. Call or email to schedule your appointment today. From our Service to Sales Departments we have a very knowledgable staff ready to give you the answers to your Duramax questions. If you are in the middle of a install, trying to diagnose a problem or looking for over the phone advice give us a call. We know these trucks front to back, top to bottom and have seen just about every concern that has come up since 2001. 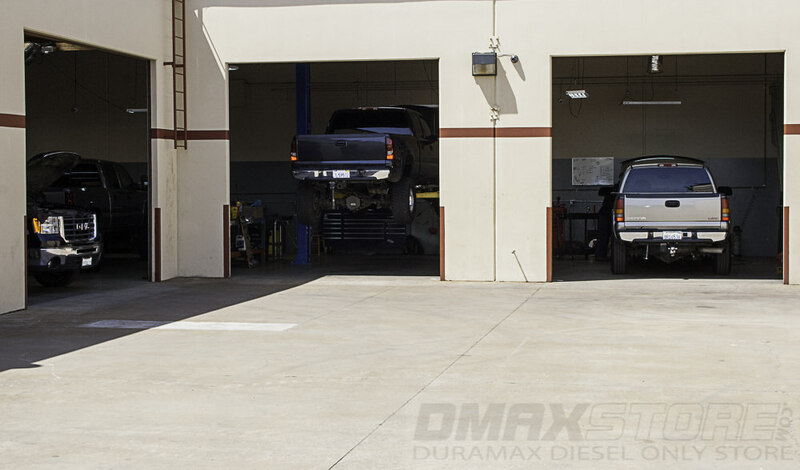 Give us a shout 877-4MY-DMAX or stop by our facility in Northern California.